Negroamaro is a dark-skinned grape variety that has been associated with Puglia for at least 1500 years. 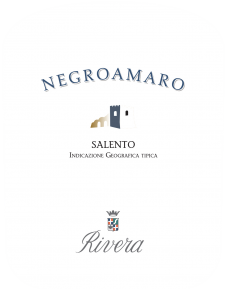 Most commonly found in a blends (for example when blended with Malvasia Nera, Negroamaro is the main component of Salice Salentino DOC wines), Negroamaro is valued for its deep color, medium-full tannins and dark berryfruit flavors. Puglia’s Salento Peninsula is arguably the source of the finest Negroamaro wines. The warm Mediterranean-style climate suits the variety well, allowing the vines to achieve optimum levels of ripeness. A relatively drought-hardy variety, it is rarely troubled by the area’s limited rainfall. Rivera’s Negroamaro is a great entry-level, and the modern winemaking results in a fresh and balanced red wine with bright aromas of dark berries, cherry and plum and a round, complex palate exiting with the typical slightly bitter finish. A versatile wine that should be enjoyed with rich pasta dishes, meat or hearty soups. ‘Salento gobelet’ style. Average yield is 80-90 quintals per hectare. Grapes are harvested during the second week of September and macerated at 25°C for 7-8 days in stainless steel vats with frequent pump-overs.